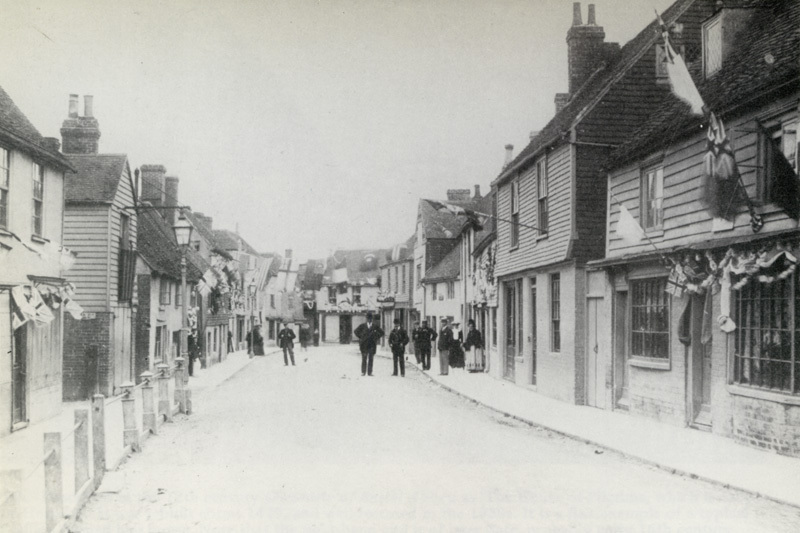 [ABOVE] A view of High Street, Battle (c1900). Ernest Bodle (1882-1940) operated as a photographer from No. 66 High Street, Battle, around 1905. Another Battle photographer Arthur Thomas Cobb (born 1873, Marylebone, London) took photographic portraits at his father's grocery store in Battle's High Street between 1896 and 1901. Ernest Bodle was born in the Hastings parish of St Mary's-in-the-Castle during the 3rd Quarter of 1882. Ernest Bodle was the youngest son of Harriett Dadd and James Bodle, a farmer holding 68 acres at Old Roar Farm on the northern outskirts of Hastings. Ernest Bodle's parents, James Henry Bodle (born c1836, Battle, Sussex) and Harriett Dadd (born 1836, Dallington, Sussex) had married in Harriett's home village of Dallington on 26th June 1859. James Henry Bodle was the son of farmer Thomas Bodle, a farmer. Harriett Dadd's parents were Thomas and Elizabeth Dadd. At the time of the 1881 census, James and Harriett Bodle were living at Old Roar Farmhouse with their five children - Frank (born c1864, Hastings ), Frederic (born 1866, Hastings), Edwin (born 1873, Ore), Harriett Jane (born 1876, Ore) and Alfred Bodle (born 1880, Ore). Ernest Bodle, the couple's last child, arrived later the following year. Sometime before 1899, Ernest's father, James Henry Bodle, had taken over Little Beech Farm near the Sussex town of Battle. When the 1901 census was taken, Ernest Bodle was described as a "Farmer's son", aged 18. By 1905, James Bodle had given up farming and his wife Mrs Harriett Bodle was running a tobacconist's shop at 66 High Street, Battle, with her youngest son, twenty-three year old Ernest Bodle. Kelly's Directory of Sussex, published in 1905, lists Mrs Harriett Bodle and Ernest Bodle at joint proprietors of the shop at 66 High Street, Battle. It was during a brief period between 1905 and 1908, that Ernest Bodle set himself up as a photographer at his mother's tobacconist's shop at 66 High Street, Battle. 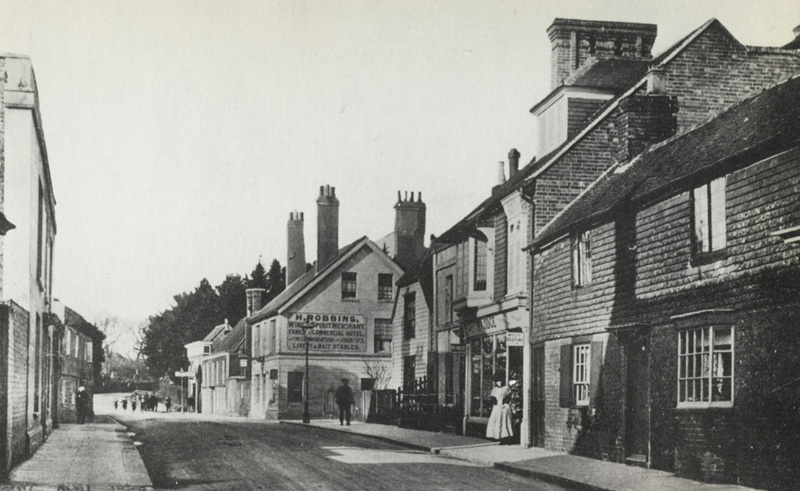 Ernest Bodle is not recorded as a professional photographer in the Sussex trade directories published by Kelly between 1905 and 1909 and by 1911, the shop at 66 High Street, Battle was in the hands of tobacconist Thomas Clark. In 1908, Ernest Bodle married Henrietta Hyland (born c1886, Battle), a twenty-two year old domestic servant. Before the end of the year, Henrietta gave birth to a daughter, Evelyn Nora Bodle. Ernest and Henrietta's daughter was born in Hastings, but her birth was registered in Battle during the 3rd Quarter of 1908. A second child, Stanley Ernest George Bodle was born in Battle in 1909, yet his birth was registered in Hastings during the 2nd Quarter of 1909. 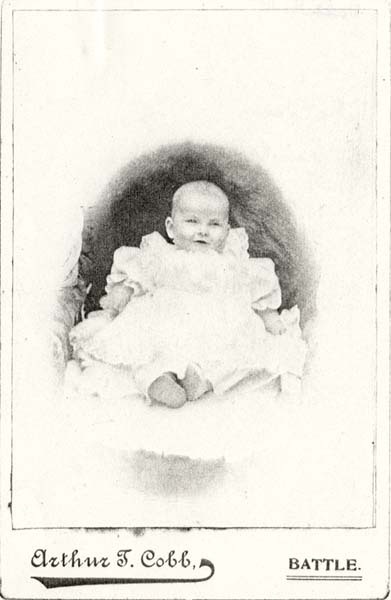 A third child, Mabel Alice Bodle was born in Battle during the 1st Quarter of 1911. The 1911 census records Ernest Bodle and his family at 39 Mount Street, Battle. At the time of the 1911 census, Ernest Bodle was working as a "Casual Labourer". 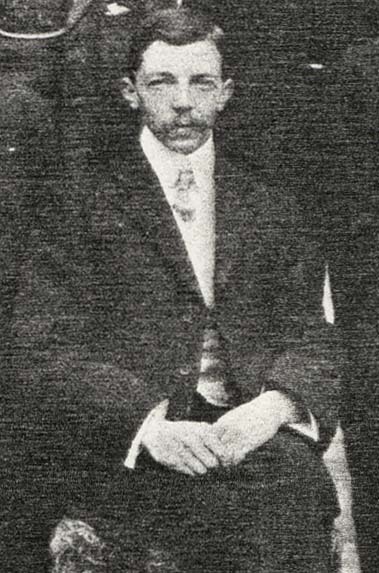 Ernest Bodle's parents, James and Harriet Bodle had both died at the age of 74 during the 2nd Quarter of 1911, but as the youngest son Ernest had probably inherited little in terms of property from his father and mother. Ernest Bodle died in Battle, Sussex, in 1940, at the age of 58. [ABOVE] A cabinet portrait of a young man wearing a flat cap, photographed by Ernest Bodle at 66 High Street, Battle (c1905). [ABOVE] A view of Mount Street, Battle (c1902). Thomas Douch (born 1860, Battle) worked as a photographer from premises in Mount Street, Battle, from around 1900 until 1930. Thomas Douch was born on 9th December 1860, the son of Jane Thomas and Charles Douch, a basket maker of Old Carrier's Yard, Battle. Charles Douch, Thomas's father, was born in Brightling, Sussex around 1825 and married his wife Jane Thomas (born c1829, Mountfield) during the 4th Quarter of 1854. After their wedding, the couple set up home in Charles Douch's home village of Brightling, where their first son, Charles Douch junior was born on 9th June 1859. By the end of 1860, Charles and Jane Douch and their infant son moved to the small town of Battle, some six miles south of Brightling. During the second week od December 1860, Jane Douch gave birth to her second son, Thomas Douch. When the census was taken on 7th April 1861, Charles and Jane Douch and their two young children were living at a house in Old Carrier's Yard, Battle. Charles Douch, the 'Head of Household' is described on the census return as a thirty-four year old "Basket Maker". In addition to Charles Douch's thirty-two year old wife Jane, their two year old son Charles junior, and Thomas, a three month old baby, Douch's home in Old Carrier's Yard also accommodated Charles Douch's fifteen year old nephew John Douch, a young agricultural labourer, and another young relative Sarah Thomas, a ten year old girl from Brightling. 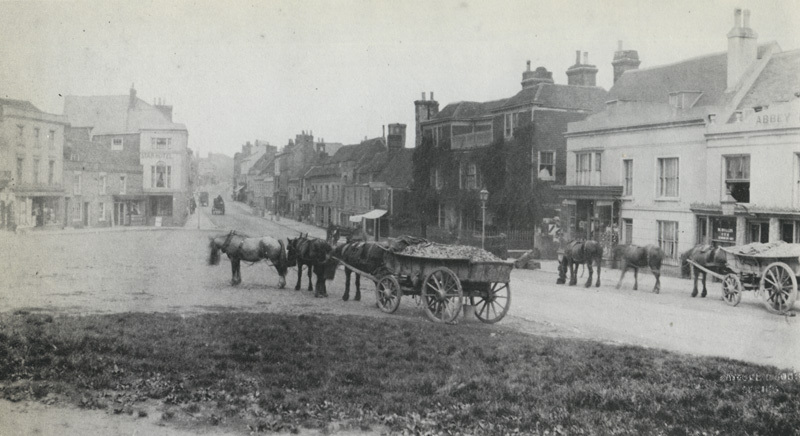 By 1881, Charles Douch and his family were living near Battle's High Street at Ticehurst Court. By this date Charles and Jane Douch were the parents of four children. A son, christened with the distinctive name of Naphtaly (Naphtali) Douch had been born in Battle on 31st March 1866 and a daughter Mary Douch had arrived a couple of years later on 17th August 1868. Charles Douch was now working as a general labourer, but money contributed to the household by Charles Douch's three grown up sons - twenty-one year old Charles Douch junior, entered on the census return as a "Taylor", twenty year old Thomas Douch, who was employed as a "Baker", and teenager Naphtali Douch, described on the census return as a "Labourer", aged 15. 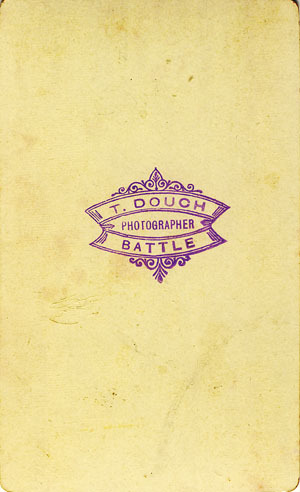 [ABOVE] The trade plate of Thomas Douch, Photographer, of Mount Street, Battle, rubber-stamped in purple ink on the back of one of his photographs (c1905). Thomas Douch probably took up photography in the 1890s. At the time of the 1891 census, twenty-nine year old Thomas Douch was working as a baker in Battle's High Street, but when the 1901 census of Battle was taken, the enumerator recorded Thomas Douch as a forty year old bachelor earning his living as a "Photographer". In the commercial section devoted to Battle in Bennett's Business Directory for the County of Sussex, published for the year 1907-08, the entry for Thomas Douch reads: "Thos. Douch, photographer, Mount St. - Children and Groups a Speciality - dark room for amateurs". Although Thomas Douch is not recorded as a professional photographer in the Sussex trade directories published by Kelly between 1890 and 1907, surviving photographs with the trade stamp "T. DOUCH, Photographer, BATTLE" indicate that he was active as a photographer at least a dozen years before Kelly's 1913 Sussex Directory first recorded Thomas Douch as a professional photographer at Mount Street, Battle. All three of Thomas Douch's siblings married. Charles Douch junior married Annie Eldridge (born c1859, St Leonards, Sussex) around 1888. The 1901 census records forty-year old Charles Douch as a "Journeyman Tailor" in Battle, living with his wife Annie and their two sons, Frank and Charles junior. Mary Douch, Thomas Douch's young sister, married Charles Feaks (born 1869, Battle) in her home town of Battle in 1889, but she and her husband moved to live in Bournemouth shortly after their wedding. Naphtali Douch (1866-1939), who had taken up his father's former trade as a basket maker, married Elizabeth White (born c1867, Battle) in 1894. The 1911 census records Naphtali and Elizabeth Douch with their eight children at their home in Mount Street, Battle. Thomas Douch, described as a forty-eight year old single man working as a "Photographer", is also recorded in Mount Street, Battle, in the 1911 census. 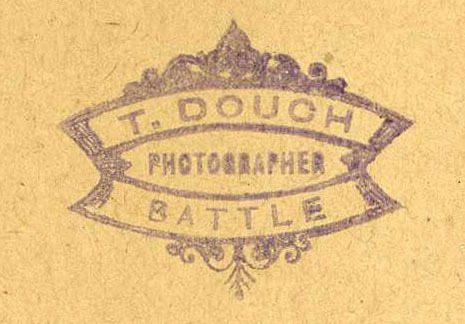 Thomas Douch worked as a photographer in Battle for over 30 years. Thomas Douch is recorded as a "Photographer" in the 1901 census and he is listed as a professional photographer in the Sussex trade directories published between 1913 and 1930. The listing for Thomas Douch, Photographer of Mount Street, Battle in Bennett's Business Directory of Sussex (1907-08) notes that "Children and Groups" were Mr Douch's speciality, adding that the photographer provided a "dark room for amateurs". Percival (Percy) White, who in the 1920s and 1930s was a press photographer for the 'Kentish Express', recalled Tom Douch as "a family friend, in whose tiny darkroom, together with my father, I spent many hours learning about developing and printing, and watching magic lantern shows". (A selection of photographs taken by Percival James White (born 1902, Battle) and his father Walter White (born 1868, Battle) can be viewed on Tim White's website Battle-Abbey.co.uk. [ABOVE] A carte-de-visite portrait of a girl, photographed by Thomas Douch of Mount Street, Battle (c1905). [ABOVE] The reverse of a carte-de-visite portrait by Thomas Douch, Photographer of Mount Street, Battle, showing his trade plate rubber-stamped in purple ink on the back of the photograph (c1905). 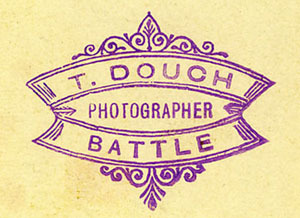 [ABOVE] The trade plate of Thomas Douch, Photographer of Mount Street, Battle, rubber-stamped in purple ink on the back of the group photograph of the Battle Town Band, illustrated on the left. 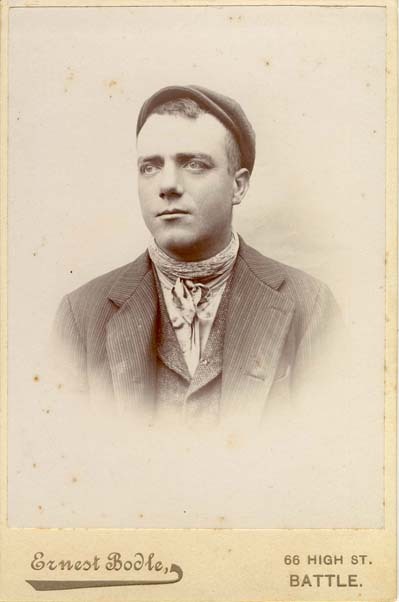 [ABOVE] Arthur Thomas Cobb (born 1873, London) photographed around 1900 when he was working as a grocer's assistant and part-time photographer in the Sussex town of Battle. [A detail from the group portrait of the Cobb brothers pictured on the right]. 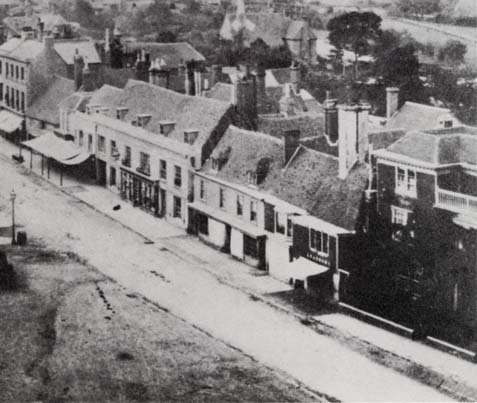 It is possible that this photograph was taken by Arthur's father, Frederick Cobb (1848-1903), who ran a grocery and wine store in Battle's High Street. Arthur Thomas Cobb took studio portrait photographs in Battle between 1896 and 1901. Arthur Thomas Cobb was born in Marylebone, London, in 1873, the eldest son of Fanny (Smith) and Frederick Cobb, a grocer and wine merchant. Frederick Cobb, who was born at Dorchester Abbey, Oxfordshire, on 15th August 1848, had married Fanny Smith (born c1852, Bishops Waltham, Hampshire) at the Register Office in Barnet on 4th June 1871. After their marriage, Frederick and Fanny Cobb lived briefly in the Marylebone district of London, where their first child, Arthur Thomas Cobb was born in 1873. By 1876, the Cobb family had settled in Folkestone, Kent, where Frederick Cobb worked as a "grocer & shopman" and, with his wife Fanny, ran a lodging house at 18 Victoria Grove, Folkestone. On 25th June 1876, Fanny gave birth to a second son, Frederick Henry Cobb. 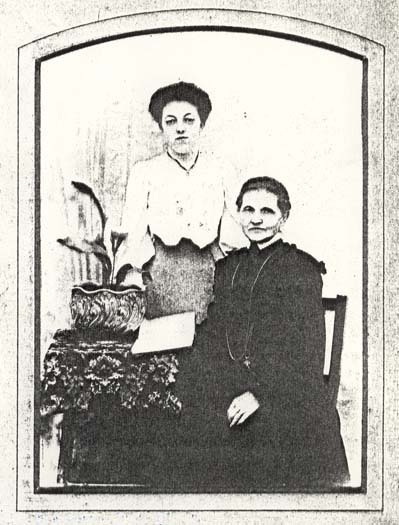 During their stay in Folkestone, there were two more additions to the Cobb family - Florence Fanny Cobb (born 1879) and Charles Edward Cobb (born 1882). We know that Frederick Cobb and his family left Folkestone around 1884, because his fifth child Grace Mabel Cobb was born in Brentwood, Essex in 1885. [Birth registered in the Essex district of Billericay during the 4th Quarter of 1885]. By 1887, Frederick Cobb and his growing family had moved to Ealing Broadway, where his three youngest children were born. Gertrude Emily Cobb was born in Ealing during the 1st Quarter of 1887, followed by Alfred Hutton Cobb (born 1890, Ealing) and Sydney Richard Cobb (born 1893, Ealing). Frederick Cobb, together with his wife Fanny and their 8 children, arrived in the small Sussex town of Battle around 1896. The 1899 edition of Kelly's Directory of Sussex, records Frederick Cobb as a "grocer & china dealer" in High Street, Battle. Frederick Cobb is also listed as an "agent for W. & A. Gilbey Limited, wine & spirit merchants" in Kelly's 1899 directory. The 1901 census confirms Frederick Cobb's occupation, describing him as a fifty-two year old "Grocer & Wine Merchant". Two of Frederick Cobb's sons, Arthur, aged 27, and nineteen year old Charles were assisting their father in his grocery and wine store. When the 1901 census was taken, Frederick Henry Cobb, Frederick Cobb senior's second eldest son, was also working as a "Grocer's Assistant" but living in Bedford, where he married Hilda Maude Coleman the following year. 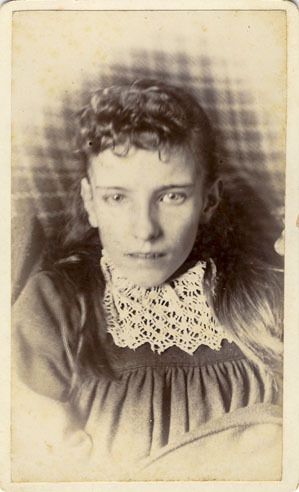 Arthur Thomas Cobb probably started taking portrait photographs in Battle soon after his family's arrival in the town around 1896. Although Arthur Cobb's main occupation was as a "Grocer's Assistant", he appears to have been working semi-professionally as a portrait photographer in Battle. A cabinet portrait of a baby, carrying the photographer's trade plate of "Arthur T. Cobb, Battle" dates from 1897. Arthur Cobb's short photographic career in Battle came to an end during the final months of 1901, when, after his marriage to Charlotte Harriet Coldman (born 1881, Hollingbourne, Kent) he moved away to Sevenoaks in Kent. 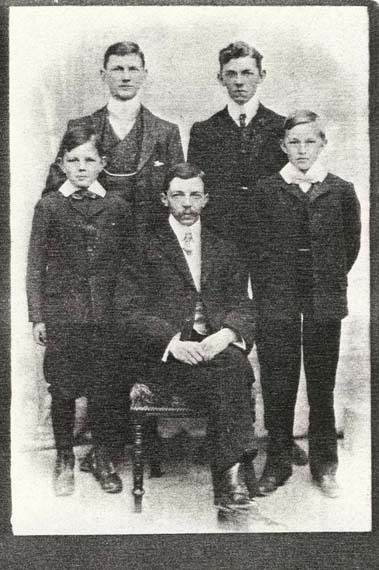 [ABOVE] A group portrait picturing Arthur Thomas Cobb (seated in the centre) with his four brothers. In the back row, standing on the left, is Frederick Henry Cobb (born 1876) and (to Frederick's left) Charles Edward Cobb (born 1882). Arthur is flanked on the left by Sydney Cobb (born 1893) and Alfred Hutton Cobb (born 1890), who stands front right. Arthur Thomas Cobb had a total of seven siblings - four brothers and three sisters - Florence (born 1879) , Grace (born 1885) and Gertrude Cobb (born 1887). [ABOVE] A cabinet portrait of Millie Coleman, aged 6 months, photographed by Arthur Thomas Cobb of Battle. (1897). The fact that the photographic mount carries the trade plate of "Arthur T. Cobb, Battle" suggests that Arthur Cobb was working professionally as a photographer in Battle during the mid and late 1890s. [ABOVE] An outdoor portrait of Frederick Cobb senior (1848-1903), the father of of Battle photographer, Arthur Thomas Cobb (born 1873, London). Although Frederick Cobb senior is pictured in an army general's uniform, he was, in fact, a grocer with a store in the High Street of Battle. 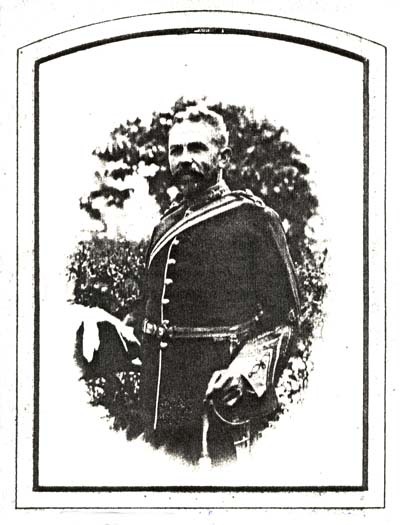 Mr Frederick Cobb was photographed in "fancy dress" by his son Arthur Cobb during the celebrations in Battle to mark the Relief of Mafeking (17th May 1890) during the Second Boer War in South Africa . A couple of years later, Frederick Cobb senior was running a grocery store at Hampton Hill, Middlesex (London Borough of Richmond). Frederick Cobb senior died at Ashton House, High Street, Hampton Hill, on 14th June 1903, aged 54. [ABOVE] A studio portrait of Gertrude Emily Cobb (born 1887, Ealing, Middx.) and her mother Mrs Fanny Cobb (born c1852, Bishops Waltham, Hampshire). Gertrude Cobb was the youngest sister of Battle photographer, Arthur Thomas Cobb (born 1873, London). This portrait was probably taken around 1909, before Gertrude Cobb moved to Horsham in West Sussex. By this date Mrs Fanny Cobb had been a widow for six years, her husband Frederick Cobb having died in 1903 at Hampton Hill, Middlesex. Accompanied by her middle daughter Grace, Mrs Fanny Cobb later moved to St Neots in Huntingdonshire where she ran a grocery store in the town's Market Square. I am grateful to Rosemary Temple of Australia for providing information about the photographic activities of Arthur Thomas Cobb. Rosemary Temple is the great grand-daughter of Frederick Cobb senior, the father of Battle photographer Arthur Thomas Cobb. Rosemary's grandfather was Frederick Henry Cobb (1876-1962), Arthur Cobb's younger brother. [ABOVE] A late Victorian view of the High Street in Battle showing the ivy-clad building Langton House opposite the entrance to Battle Abbey. Langton House was the home of the Ticehurst family of Battle. Originally the town's poorhouse, in 1829 Langton House passed into the hands of schoolmaster William Ticehurst, the father of Francis William Ticehurst and grandfather of Battle photographer Frederic Gorham Ticehurst. Langton House was the home of Frederic Gorham Ticehurst at the turn of the century and remained in his possession until his death in 1922. From 1965 until 2002, Langton House was the building that housed The Battle Museum of Local History. Today, Langton House at 81 High Street, Battle provides offices for a number of local businesses. [ABOVE] The trade plate of Frederick G. Ticehurst, Photographer, Battle (c1874). Frederic Gorham Ticehurst was born in Battle, Sussex, in 1849, the son of Jane Gorham and Francis William Ticehurst, a printer, bookseller and stationer. Francis William Ticehurst (born 1811, Battle) had married Jane Gorham (born 1816, Battle) in Hastings in 1838. The union of Jane Gorham and Francis William Ticehurst produced at least ten children - Jane Frances Ticehurst (born 1839, Battle), Francis William Ticehurst (born 1841, Battle), Ellen Elizabeth Ticehurst (born 1842, Battle), Emily Anna Jane Ticehurst (born 1843, Battle), George Frederick Ticehurst (born 1845 - died 1858, Battle), Frederic Gorham Ticehurst (born 1849, Battle), Elizabeth Ticehurst (born 1851, Battle), Charles James Ticehurst (born 1853, Battle), Clara Charlotte Ticehurst (born 1855, Battle) and Kate Maria Ticehurst (born 1857, Battle). Francis William Ticehurst (1811-1902), Frederic's father, was a leading figure in the town of Battle. In 1855, Francis William Ticehurst was the proprietor of a bookselling and printing business at 77 High Street, Battle and was the town's Post Master. The 1859 edition of The Post Office Directory of Sussex lists Francis William Ticehurst as a printer, bookseller & stationer at 76 & 77 High Street, Battle. In addition to his duties as "Postmaster", Francis William Ticehurst was also serving as the Clerk to the Board of Guardians of the Battle Union being employed as the Superintendent Registrar for the Battle Union Workhouse. The 1861 census records Francis W. Ticehurst as "Head Post Master, Battle, Sussex, & Superintendent Registrar of Deaths, Births & Marriages" residing in High Street, Battle, with his wife and five children. By 1870, Frederic Gorham Ticehurst (Francis William Ticehurst's second eldest surviving son) had joined with a Mr Sparks to form the firm of Ticehurst & Sparks, described as "coal, coke & lime merchants" in a local trade directory. It was around this time that Frederic G. Ticehurst became interested in photography and began to take photographic views around Battle. In the early 1870s, Frederic G. Ticehurst was described as a "Photographer of buildings, views, etc." A number of carte-de-visite photographs of well-known buildings and beauty spots, carrying the credit "F. G. Ticehurst, Photographer, Battle" have survived from this period. 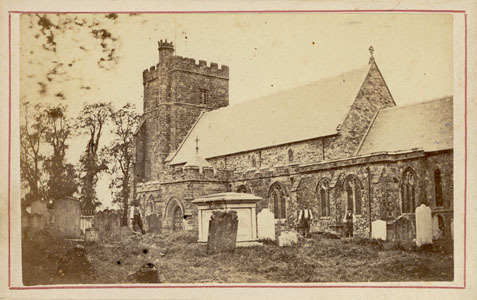 It is likely that these small carte-de-visite views of Battle and the surrounding area were sold at his father's bookshop and stationers business at 76 & 77 High Street, Battle. A young man in his early twenties, Frederic G. Ticehurst appears to have been particularly interested in recent developments in science and technology during this period of his life. The 1871 census records Frederic G. Ticehurst as a "Practical Electrician" aged 21, living in the High Street of Battle. On 19th April 1876, at Hellingly Church, twenty-seven year old Frederic Gorham Ticehurst married Caroline Maria Pitcher (born 1852, Hailsham, Sussex), the twenty-three year old daughter of Maria and David John Pitcher, an auctioneer's clerk from Upper Horsebridge, Hellingly. A son, named Frederic Gorham Ticehurst after his father, was born in Battle during the First Quarter of 1877. A second son, Arthur Cecil Ticehurst, was born in Battle early in 1880. John William Ticehurst, the couple's third son was born in Battle during the 3rd Quarter of 1885. In 1878, Frederic Gorham Ticehurst was apparently still dealing in coal and fertilizer. In Kelly's Directory of Sussex, published in 1878, Frederic Gorham Ticehurst is listed in the commercial directory of Battle as a "coal, coke & artificial manure merchant". By the time the 1881 census was carried out, Frederic G. Ticehurst was working as a "Telegraph Engineer" and had been appointed Superintendent Registrar for the Battle Union. Frederic Gorham Ticehurst was now residing at The Old House (Langton House) at 81 High Street, Battle. During this period of his career Frederic Gorham Ticehurst was providing clerical duties for a range of public bodies. Kelly's Directory of Sussex, published in 1890, records Frederic Gorham Ticehurst as Clerk to the Guardians of the Battle Union, Clerk to the Burial Board, Clerk to the Assessment Committee, Clerk to the Rural Sanitary Authority, Clerk to the School Attendance Committee and Superintendent Registrar for the Battle Union. The 1901 census records Frederic G. Ticehurst at 81 High Street, Battle. Frederic G. Ticehurst is described on the census return as the "Clerk of Guardians", aged 51. Kelly's 1903 Directory of Sussex lists Frederic G. Ticehurst at Langton House, Battle, describing him as "Clerk to the Guardians, Rural District Council". In Kelly's 1915 Directory of Sussex, F. Gorham Ticehurst is shown at Langton House, 81 High Street, Battle holding the position of "Clerk to the Guardians & Assessment Committee". Frederic Gorham Ticehurst died in his home town of Battle during the First Quarter of 1922 at the age of 72. [ABOVE] A view of Battle Church, photographed by Frederick G. Ticehurst of Battle (c1874). [ABOVE] The reverse of a carte-de-visite view photographed by Frederick G. Ticehurst, of Battle (c1874). 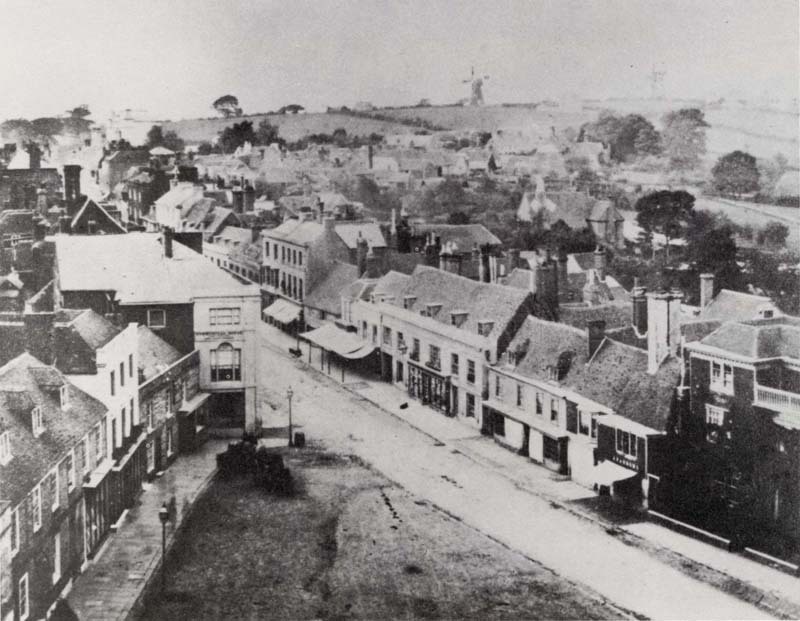 [ABOVE] A photograph of the town of Battle taken from the top of the Abbey Gateway showing the High Street and, in the distance, Caldbec Hill (c1870). 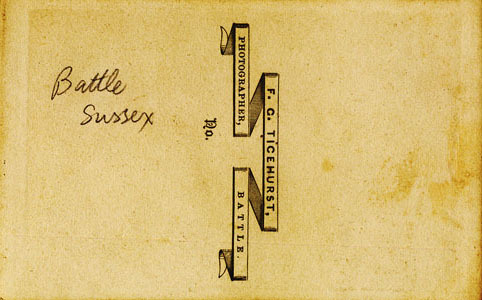 [ABOVE] The reverse of a carte-de-visite view photographed by Frederick G. Ticehurst of Battle (c1874). 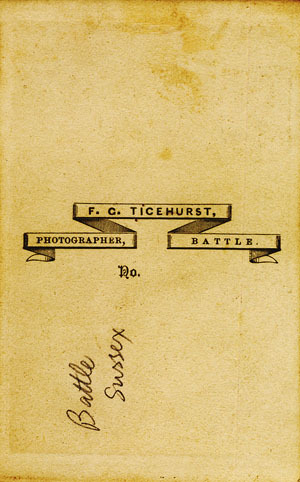 F. G. Ticehurst's photographic views of Battle were probably sold at his father's bookshop and stationery business, Francis W. Ticehurst, at 76 & 77 High Street, Battle. 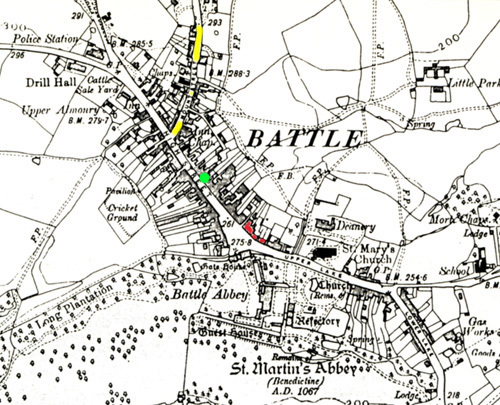 [ABOVE] A 1910 map of the town of Battle showing the location of Frederick G. Ticehurst home at Langton House, 81 High Street Battle and his father's business premises at 76 & 77 High Street, Battle [marked in red], Ernest Bodle's tobacconist shop at 66 High Street, Battle [marked in green] where he took photographic portraits around 1905 and Mount Street, Battle [shaded in yellow], where Thomas Douch operated as a photographer between 1900 and 1930. [BELOW] The trade plate of Ernest Bodle, photographer at 66 High Street, Battle. 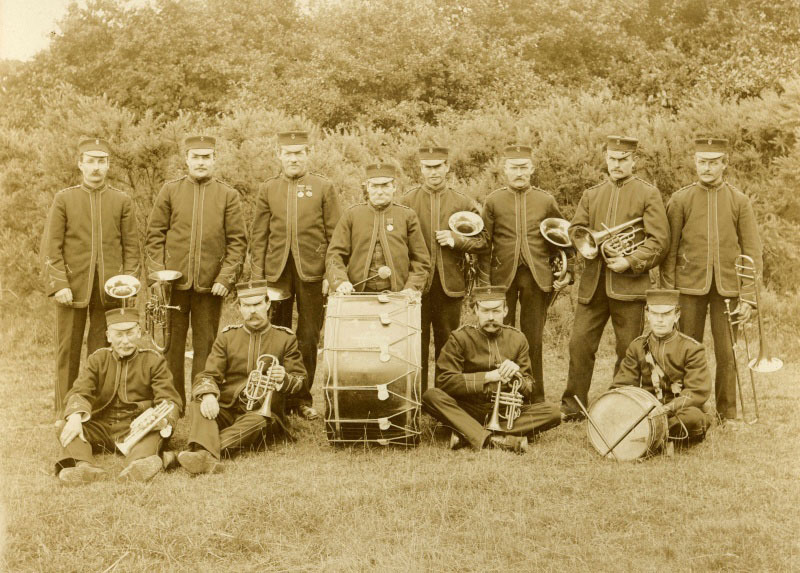 I am grateful to Tim White for allowing me to use Thomas Crouch's photograph of the Battle Town Band , which features his great grandfather Walter White.